We are a small but ambitious group of volunteers working to help animals in Appalachia. This help may come in the form of beds and supplies for existing shelters or coordinating transport, vet care, rescue, and adoption of our furry friends. Wag'N Wheels is a project of the IRS recognized nonprofit, Grandma's Gifts. 100% of donations will go to ease the lives of animals - all donations are tax deductible. Wag'N Wheels is a registered rescue with the Ohio Department of Agriculture. 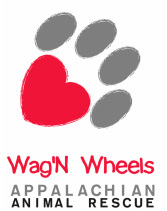 Follow us on Facebook or Twitter (@WagNWheels) and watch us grow! Treat me kindly, my beloved master, for no heart in the world is more grateful for kindness than my loving heart. And, beloved master, should the Great Master see fit to take my health or sight, do not turn me away from you. Rather, hold me gently in your arms as skilled hands grant me the merciful boon of eternal rest and I will leave you knowing with the last breath I draw that my fate was ever safe in your hands.